ashar was born in Surrey, the UK in 1942. Is currently living and working on the Levels in Somerset. Spending the first months of the year on the moors sketching. Using these sketches to reconnect with her feelings for a place, when back in the studio working. Since graduating with a BA (Hons) in fine art from Plymouth ashar has continually challenged her practice. Working in oils on wooden panel creating abstract works with the ability to move the viewer. Endeavouring to paint her responses to place and not what she sees. The levels and moors being her inspiration, however ashar says “I do not want to depict them I want to express my feelings for them and create work that has the ability to be felt”. She has work in collections all around the world, including Singapore, Australia and Europe, as well as a piece in The Millfield Collection. In 2017 ashar’s piece ‘let go’ was hung and sold at the Royal Academy. A finalist at “The Chaiya Art Awards” 2018. A Finalist in British Woman Artists 2017. Runner-up for Annex Acquisition Collection Award 2017. 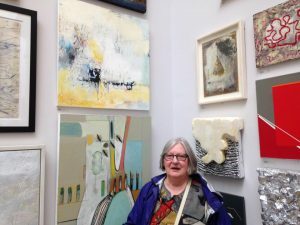 Prizes from The Atkinson Open and Fringe Arts Bath 2016. The materials she uses and the processes are an important part of her practice. ashar works in mixed media on wood panels and works mainly in oils with other media such as oil pastel, graphite, metal leaf, crayon, ink pencils and anything else that may fit the piece.